Balance powerful performance and customized convenience with affordability. 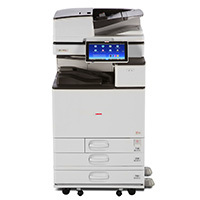 The LANIER MP C4504 Color Laser Multifunction Printer (MFP) features Workstyle Innovation Technology, so you can move between jobs with touchscreen precision. Print colorful output at up to 45 pages per minute (ppm). Share them with anybody instantly via one-touch scanning workflows, tailored shortcuts and mobile convenience. Plus, you can also send and receive paperless faxes using email to save time.